This group meets on Monday nights from 6.00 p.m. and is a small group of people who give their time to tackling some of the jobs needing doing both inside the church building and in the grounds. This past winter the main project has been the re-painting of the interior of the church. 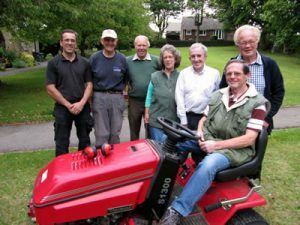 In summer the focus is on making the outside of the church and grounds look neat and tidy with regular grass cutting taking place when the weather permits. Anyone is welcome to join in, weekly attendance is not obligatory, the satisfaction of seeing a job well done is certainly worthwhile. For more information contact Colin Dracup on 01484 306513.